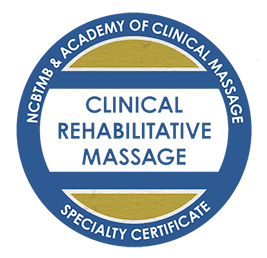 The National Certification Board for Therapeutic Massage & Bodywork (NCBTMB), in partnership with some of the profession’s most experienced educators, announces the profession’s first Clinical Rehabilitative Massage Specialty Certificate. What is the Clinical Rehabilitative Massage Specialty Certificate? The Clinical Rehabilitative Massage training prepares practitioners with the essential clinical skills and advanced knowledge necessary for working with musculoskeletal pain and injury complaints. This program integrates clinical science with hands-on protocols through innovative hybrid online and classroom study. The program prepares professionals to work in settings that require advanced clinical skills. It offers stakeholders, such as insurance companies, employers, and clients a way to validate a practitioner’s specialized training. Stakeholders, such as employer’s, insurance providers, and clients all want to know that you have appropriate training to address pain and injury conditions that you may be presented with. The Clinical Rehabilitative Massage Specialty Certificate Program is an innovative training that develops the advanced skills needed so that you do not have to rely on oversimplified recipes or routines that limit your effectiveness. This training will allow you to engage essential clinical reasoning, tap into advanced knowledge, employ superior client management skills, and secure the clinical skill-set for effective treatment – which are the hallmarks of the truly successful clinician. Train with some of the top educators in the profession: Whitney Lowe, Judith Delany, James Waslaski, Don Kelley, Douglas Nelson, and others. These highly-respected instructors bring years of clinical expertise in advanced massage therapy, as well as substantial educational experience. To qualify for the program you must have a valid license to practice massage in your own jurisdiction and have completed an entry-level massage training program of at least 500 hours in length. Upon completion of all requirements, you will earn the NCBTMB Specialty Certificate in Clinical Rehabilitative Massage. You will also receive a letter of verification outlining the education you have received, which may be provided to stakeholders, such as employers. NOTE: Previous workshops by any approved provider and orthopedic massage online courses by W. Lowe may be applied to this Certificate. Please email the Academy office with: your name, course dates, CE, instructor name, and title of your workshop or online course. The core educational program is the Clinical Orthopedic Massage Online Program. Lowe expanded this program to meet the curriculum needs of the Specialty Certificate. This grounding centerpiece is built around a competency-based education (CBE) model and is unlike any other online course offered in the profession. The online component focuses on key cognitive and clinical reasoning facets of rehabilitation science: anatomy, physiology, biomechanics, pathology, kinesiology, assessment, condition problem-solving, and treatment planning. This core curriculum emphasizes what is called applied learning, which is a innovative learning method that allows the learner to apply the concepts and information in dynamic and engaging ways in unique exercises and activities. This unique approach helps the learner navigate the multi-faceted and often complex elements of pain and injury treatment, and function not with rote recall of information, but savvy clinical reasoning. This core curriculum functions as the foundation for the clinical skills taught in the hands-on component of the training. There are seven body region courses that comprise the full online program. The online program is a facilitated course, meaning that you will have frequent contact with your instructor, Whitney Lowe. You will have independent exercises, reading and study materials, hundreds of video presentations (which you can continue to consult after you finish the program), and assignments that you submit to your instructor. The courses are performed online in an advanced online platform that engages you in an active way in your learning. While videos and text do play a part in the program, these courses utilize the more advanced elements of applied online learning methods and instructional design, making the program far more interesting than simply watching videos and reading. The hands-on courses provide the learner additional advanced massage training and the physical skills required for doing pain and injury treatment. Participating instructors in this program have been specifically selected because of their unique contributions to advanced massage training. All have decades of experience in pain and injury treatment and have established reputations for being some of the nations’ top educators. Though they have core similarities in their training, each instructor has their own unique approach and treatment modalities that they prefer. Learners may choose whichever educator they feel fits their needs most. The National Certification Board of Massage Therapy conducts the Specialty Certificate exam online. Access to the test is provided through the Academy of Clinical Massage after the program requirements have been fulfilled. What are the eligibility requirements for the course? Is the Core Foundation only offered by the Academy? The Clinical Rehabilitative Massage Specialty Certificate does not focus on technique. Rather it emphasizes a consolidated set of specialized knowledge, skills, and abilities involving cognitive activities such as clinical reasoning, anatomy, biomechanics, treatment planning, pathophysiology, and other facets of rehabilitation science. For that reason, the largest portion of this program is devoted to those core concepts of rehabilitation science which are consistent across a wide variety of treatment paradigms and methods. Currently, the Academy’s online program is the most comprehensive program that meets this challenging core curriculum. However, in the future there may be additional programs that also meet the rigorous educational criteria that have been established for this Specialty Certificate. Where do I take the hands-on courses? There are many different locations where you can take classes that meet the hands-on course requirement. Click here to see the schedule page of current classes. More class locations will be continually added, so keep checking back for one near you. How do you verify completion of the hands-on courses? Please request a signed copy of a certificate from the provider of the hands-on workshops you have taken; a CE certificate form is sufficient. It is preferred that you take at least one of the workshops after you have taken some of the online courses. When you have completed the online program and both of the hands-on course requirements you are eligible to sit for the final certification exam administered by the NCBTMB. Please send all verification documents to our office at info@academyofclinicalmassage.com. Do I have to be online at a certain time for the online portion? The online program is totally asynchronous, which means you can work in the program any time you want. You can do very small chunks of the program any time it is convenient. Why not login and do some study during that client appointment cancellation! Do I get certified after completing the program? There is a great deal of confusion in our field about the term “certification” in relation to CE programs. There is actually only one true “Certification” program in our field and that is the NCBTMB Board Certification credential. All the other programs are actually what is called an assessment-based certificate (ABC) program. Learn more about the difference by reading this post. The hands-on courses are a minimum of 16 hours each for an upper body course and a lower body course. The amount of time it takes to complete the online course is really dependent on how much time you devote to it. The program averages about 130 CE hours, but the amount of actual time spent in the course can vary with your experience. How do I sign up to take the exam? Completion of the hands-on workshop requirement (send documentation to us). Send all documentation to: info@academyofclinicalmassage.com. The cost of the hands-on workshops is determined by each presenter so consult their website page to find out how much each hands-on course will cost. The full 130 hour online program is $750 (but you will find Academy specials and discounts at certain times of years and with certain promotions). The final certification exam administered by the NCBTMB is $95. You do not need a payment plan with the online courses part of the program. Online courses may be purchased individually, or as smaller bundles, spreading your investment out across several months. Click here to see the course pricing and package discounts available for the online course component. I just took some of these courses. Do they count toward the certificate? I’m more of a hands-on learner. Why is so much of this program online? This is a common question from people who have either never taken an online class with us or have had a bad experience with online learning previously. It is crucial to remember that treating pain and injury conditions is not simply about treatment technique. Success with pain and injury treatment is far more about integrating knowledge and skills across multiple disciplines (kinesiology, biomechanics, pathology, treatment planning, etc.). It is also about being able to think and problem solve. This extensive knowledge is combined with your advanced palpation and client handling skills that you learn in the hands-on classes. I attempted to teach these complex aspects of rehabilitation science in the workshop format for years and found that there was simply too much information for people to process and integrate in a 2-day workshop. Students were mentally burned out and simply could not recall all the detail of what they learned in the workshop. I was convinced there had to be a better way to present this comprehensive material in a way that would stick and help people be more successful clinicians. Breaking the coursework of the online component into much smaller segments lets you learn when it is most convenient for you and it also allows us to use advanced interactive learning strategies that we can’t use in the classroom. Click the links below to learn more about why we’ve been devoted to raising the bar with online education in the massage field. What previous courses apply from Lowe's training? Answer: Any of the Orthopedic Massage 18-40 CE online courses may be applied. Any of Lowe’s Upper or Lower body Orthopedic Massage workshops may also apply. What if I have finished the full online program or the Specialist (or Ultimate)? Answer: Then you have completed the program, and may contact us to gain access to the NCB test. Email us.